This bottle is part of a group of late Qianlong bottles with heavily bubbled grounds, and bright, multi-colored overlays. 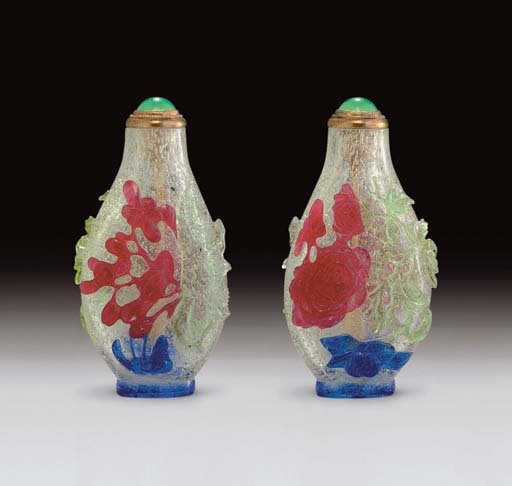 Certain groups of mid-Qing glass snuff bottles have been attributed to the Xin or Yuan family of glass carvers (Xinjiapi and Yuanjiapi respectively). Unfortunately, however, the only early information on these families and their wares comes a century after their time and is hardly sufficient for any confident attribution. They are mentioned by nineteenth-century snuff connoisseur Zhao Zhiqian in his Yonglu xianjie where he writes that the Xin, Le and Yuan family overlays were famous during the Qianlong period: "All the ones made in this way might be called overlays (pi) and the most famous of these are the Xin family overlays (Xinjiapi), Le family overlays (Lejiapi) and Yuan family overlays (Yuanjiapi)." The Xin family overlays are described as similar to those made by the Yuan family, and according to Zhao Zhiqian, "are the most cleanly done, and, as their colors are made out of crushed gems, the lustre dazzles the eye". The Le family overlays, on the other hand, "have a lotus[-root] powder ground as white as frozen snow. The way the colors are arranged is also quite extraordinary, with red, purple, sky-blue, and kingfisher-blue alternating one with the other in a natural fashion." The begonia (qiuhaitang) has long been an esteemed garden plant in China, often planted on rockwork and used as ground-cover in small areas of shade. It is associated with feminine qualities because of its preference for cool, shady places and there is a legend that a spot watered by the tears of a woman deserted by her lover suddenly sprouted begonias to console her. The sound tang in the name of the begonia (qiuhaitang) was probably intended to evoke the idiomatic expression yutang fugui ("[May your] magnificent hall [be filled with] riches"). The begonia is commonly linked to the magnolia (yulan) to elicit the sound of the first half of this expression. The peony, "the king of flowers," represents prosperity, and is associated with the upper classes of society.